Andrew Ashley Green was born on 25 December 1946 in Perth, Western Australia. His father Ernest Joseph Green was an ENT Surgeon in Perth and his mother a nurse from Victoria. His primary and secondary schooling (1956-63) was at Scotch College, Perth. 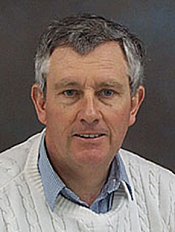 He obtained his BSc with First Class Honours in Chemistry in 1976 and his PhD in Physical Chemistry in 1970, both from the University of Western Australia. His PhD training as a spectroscopist at the University of WA proved an ideal grounding for his subsequent involvement in a new, space-based form of spectroscopy: potential mineral deposits can be identified in LANDSAT images through their distinctive spectral signatures at infra-red and visible wavelengths. His career with CSIRO started in 1970 with the award of a CSIRO Postdoctoral Fellowship to work on infrared spectroscopy at Stanford University. While in the USA, he was recruited by Ken McCracken, Chief of the new CSIRO Division of Mineral Physics, who saw the potential for multispectral satellite data to contribute to mineral exploration in Australia. In 1987, he was appointed Assistant Chief, CSIRO Division of Mineral Physics and Mineralogy and Deputy CSIRO Chief of Division of Exploration Geoscience in 1990. In 1992, he was appointed Director of the Cooperative Research Centre for Australian Mineral Exploration Technologies, a position he held until his retirement from CSIRO in December 2001. The availability of these enhanced images made people realise the potential benefits of LANDSAT data. These images were marketed to industry in the late 1970s, in one of CSIRO’s early commercialisation ventures. The same concepts were then used to define the specifications for the Australian LANDSAT receiving station, which allowed Australian users much faster access to satellite data. In 1984, Andy led a CSIRO team, which, through innovative signal processing, developed a simple, low-cost upgrade to the LANDSAT station at Alice Springs so that exploration companies, agricultural and environmental users could obtain digital images of the next generation of LANDSAT data. The internationally acclaimed image processing concepts developed for satellite data by Andy are now standard procedures used by exploration companies around the world and have been incorporated into many commercial packages. There have been major spin-offs into other areas of mineral exploration, with most geophysical data now being presented in image format. This is truly a case where a picture is worth a thousand words. In addition, Andy’s work in noise removal and data levelling significantly improved the quality of airborne exploration data. Dr Green said that once potential users – including the minerals industry, agriculture and environment protection agencies – began to use LANDSAT images, it generated a strong demand for Australia to install its own receiving station to obtain data from NASA’s new LANDSAT thematic mapper. The work is still fascinating because of the constant challenge to detect the very weakly expressed characteristics of mineralisation which tend to be swamped by other, more dominant features in a satellite image. I think of it as a signal-to-noise problem: the geological targets of interest are very hard to recognise against a background of paddock boundaries, fire scars, topographic features and other natural and man-made variability. Our success has been based on our ability to find new ways to express and enhance subtle geological features present in satellite data. In 1991, Andy was selected by the Australian mineral exploration industry to establish and lead the Cooperative Research Centre for Australian Mineral Exploration Technologies (CRC AMET). As Director until 1996 and then as a project leader, he played a pivotal role in the development and delivery of the TEMPEST airborne electromagnetic system. TEMPEST is not only being used widely, and with success, by the exploration industry but is also being deployed to map salinity as part of the Federal Government’s National Action Plan for Salinity. I have been involved with airborne and space-borne geophysics and remote sensing for longer than I care to remember. I started remote sensing and image processing research with CSIRO at high frequency and gradually migrated fourteen orders of magnitude down-frequency to work on airborne EM systems. Over time my research seems to have reverted almost to childhood taking me back to working in the area of my PhD in infra-red spectroscopy. However, I have retained an interest in the integrated analysis of geophysical data and in the understanding and estimation of risk in mineral exploration. Although I left CSIRO some years ago I continued to be involved in research and occasionally assist CSIRO with special projects. Green AA, 2010, Personal communication.